This paper aims to describe the interfollicular autologous platelet-rich plasma injections (0.20 mL x cm2) in the scalp of 23 patients affected by androgenetic alopecia at a depth of 5 mm using a medical injector gun equipped with a 30 gauge needle, in three sessions. Gentile, P., Garcovich, S., Scioli, M. G., Bielli, A., Orlandi, A., Cervelli, V. Mechanical and Controlled PRP Injections in Patients Affected by Androgenetic Alopecia. J. Vis. Exp. (131), e56406, doi:10.3791/56406 (2018). 23 patients (18 male and 5 female) aged 21-70 years who displayed male pattern hair loss (MPHL) in Stage 1 to Stage 5 as determined by the Norwood-Hamilton classification scale, and female pattern hair loss (FPHL) in Stage 1 to Stage 2 as determined by the Ludwig classification scale, were treated with non-activated autologous platelet-rich plasma (A-PRP). Autologous blood (55 mL) was harvested using sodium citrate as an anticoagulant. A-PRP (23 mL) was produced for all cases using a closed system according to the transfusion service protocol. Following centrifugation (260 x g for 10 min) the A-PRP was inserted in a laser light selector device, and after the centrifugation, 9 mL of A-PRP was collected. The scalp of the patients affected by androgenetic alopecia (AGA) was divided into four areas (frontal, parietal, vertex, and occipital); local anesthesia was not performed. 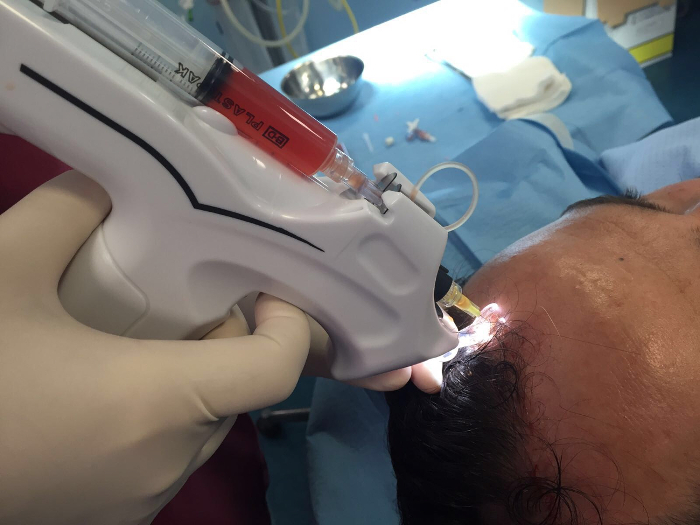 Interfollicular A-PRP injections (0.2 mL x cm2) were performed by controlled and mechanical injections scheduled at a depth of 5 mm using a medical injector gun. Treatment sessions were performed with a 30-day interval. For each patient, three treatment sessions were performed. PRP was injected in the androgen-related areas of scalp affected by hair loss. Placebo (normal saline solution) was loaded in another syringe (10 mL) and injected on the adjacent side in a similar fashion. The clinical injection of non-activated A-PRP has become an attractive resource for targeting hair growth. Here, the protocol of the A-PRP application in AGA is reported, using mechanical and controlled injections. Currently, only oral selective 5-α-reductase inhibitor, topical diaminopirimidilpiperidin-N-ossido (2.0% and 5.0%), and low-level laser therapy (LLLT) are approved by the US Food and Drug Administration (FDA) to combat MPHL1,2. Diaminopirimidilpiperidin-N-ossido 5% foam is also approved by the FDA for FPHL. The selective 5-α-reductase inhibitor has proven largely ineffective in treating FPHL3, and, given that the drug may cause abnormalities in the external genitalia of male fetuses, is unsuitable for use by pre-menopausal women4. Conversely, daily treatment with 1 mg of selective 5-α-reductase inhibitor has been shown to reduce serum dihydrotestosterone (DHT) levels by 70% and promotes hair growth of anagen hair leading to gradual increase in hair diameter and hair elongation in male AGA patients5,6, through significant improvements in hair density. The use of oral selective 5-α-reductase inhibitor may require up to one year of treatment and users may develop loss of libido, which may persist after the medication is discontinued7. Recently, the use of LLLT has been proposed to stimulate hair regrowth. Afifi et al.8 reviewed the existing research studies to determine whether LLLT was an effective therapy for AGA. The topical application of activated autologous platelet-rich plasma (AA-PRP) to harvested follicles prior to implantation has already been shown to increase their survival rate by 15% in patients affected by AGA9, as well as exhibit increased hair density 3 months post-surgery with terminal hair density increasing by 19% during that time10. These findings were confirmed in a study following AGA patients treated with calcium-activated PRP over the course of one year11. Given the positive results of AA-PRP12 and A-PRP13 as an alopecia treatment, and the lack of data for the clinical injections system, the primary aim of this work is to show mechanical and controlled PRP injections protocol. 18 male and 5 female patients aged 21-70 years who displayed MPHL in Stage 2 to Stage 5 as determined by the Norwood-Hamilton classification scale, and FPHL in Stage 1 to Stage 2 as determined by the Ludwig classification scale, were treated with mechanical and controlled injections of A-PRP. AGA diagnoses were made by a medical history, trichoscopic analysis, clinical evaluation with negative hair pull test, laboratory tests, and urinalysis. The stage of AGA was evaluated using the Norwood-Hamilton and Ludwig scale. All of the participants included in this study were assessed by a medical doctor specialized in dermatology and two plastic surgeon experts in regenerative plastic surgery and alopecia. The authors considered localized and systemic exclusion criteria for all patients. Systemic criteria were represented by blood and/or platelet disorders, anticoagulant and/or antiaggregation therapy, sepsis, immunosuppression, cancer, use of oral selective 5-α-reductase inhibitor or antiandrogens in the previous 12 months. Localized exclusion criteria were represented by use of diaminopirimidilpiperidin-N-ossido (2.0% and 5.0%) or corticosteroids for topical treatments in the previous 12 months. The study protocol complied with the Declaration of Helsinki, and all patients provided written informed consent before participating in the study. Harvest 55 mL of autologous blood from a peripheral vein of the arm using a tube with butterfly needle according to the local blood collection protocol. Add 7 mL of acid citrate dextrose (ACD) solution (112 mM of citrate) to the blood tube as an anticoagulant. Centrifuge the blood collected in the tube at 260 x g for 10 min. Note: 23 mL of A-PRP + Autologous Platelet-Poor Plasma (A-PPP) and 20 mL of Red Blood Cells suspension (RBCs) were produced. Take out the tube containing A-PRP + A-PPP and RBCs from the centrifuge and insert it in a laser light selector device. Separate A-PRP + A-PPP in a sterile bag by mechanical suction performed by the laser selector in which the kit is placed. RBCs are automatically removed by mechanical suction. Note: 14 mL of A-PPP was manually harvested and removed by the sterile bag from the kit. 9 mL of A-PRP was obtained. Divide the scalp of the patients affected by AGA into frontal, parietal, vertex, and occipital areas. Caution: Do not perform anesthesia (local or systemic). Perform interfollicular A-PRP injections (0.20 mL x cm2) by the medical injector gun (see Table of Materials) to selected areas of the scalp. In patients with hair loss localized to the frontal and parietal areas, perform A-PRP injections exclusively to the frontal area and use saline as placebo in the parietal area. In patients with hair loss localized to the parietal and vertex areas, inject A-PRP in the parietal area, and use saline as placebo in the vertex area. Perform an equal number of A-PRP and placebo injections for each patient. Perform interfollicular A-PRP injections at a depth of 5 mm using the medical injector gun equipped with a 30G needle and 10 mL syringe. Perform three sessions spaced 30 days apart. The hair growth parameters measured three months after the third A-PRP injections by tricoscopic analysis were compared with the baseline measurements and between the A-PRP treatment area and the control area, which received physiological saline injections as placebo. Before the first treatment, at baseline, no statistical differences in hair count (122 ± 10) and hair density (218 ± 17) were reported between the targeted area and controlled area (126 ± 9 baseline hair count controlled area), (225 ± 15 baseline hair density controlled area). The results obtained indicate that three months after the third A-PRP injections treatment with mechanical and controlled A-PRP injections, mean hair count increases significantly over baseline values in male patients. The targeted area showed an elevated hair count (158 ± 11) (36 ± 3 hairs compared to the baseline) and total hair density (282 ± 20) (65 ± 5 hair cm2 compared to the baseline), while the controlled area that received saline injection as placebo had negligible changes in hair count13. These values reflect a 31% ± 2% increase in hair density for the treatment group and less than a 1% increase in hair density for the placebo group. Figure 1. Interfollicular A-PRP injections by the medical injector gun equipped with a 30G needle, 10 mL syringe. Interfollicular A-PRP injections (0.2 mL x cm2) were performed at 5 mm of depth. Please click here to view a larger version of this figure. Table 1. Relevant hair-growth parameters assessed by Trichoscan analysis for the A-PRP treatment and placebo negative control half-head areas at baseline and 3 months after the third treatment. The authors demonstrated that mechanical and controlled injections of A-PRP represent viable AGA treatment options, with reduction of pain during the procedure compared with manual injection performed by the hands of the surgeon. Patients treated with this protocol were found to have greater increases in hair count and total hair density than patients treated with manual injections. The most important aspect to obtain an improvement of hair count and hair density is to pay attention to detail in various steps during the PRP preparation and the injection technique. For example, to obtain a good hair improvement, it is very helpful to use a sterilized closed system according to the transfusional service rules for PRP preparation and to perform mechanical injection of PRP. Before starting the injections, it is important to place the syringe with PRP in its definitive position, into the gun. After, it is necessary to use a 30G needle. As previously described, we prefer to use a medical injector gun for mechanical and controlled injection of PRP; this provides the additional advantage of minimizing subjective bias produced by manual injections. In fact, the use of a mechanical device as a gun has the additional advantage of decreasing the probability of inadvertently injecting different amounts of PRP at different depths to the targeted area. The authors observed that mechanical and controlled injections of PRP in the targeted area of the scalp using a gun or mechanical device, not only allows a better injection (more strict), but also minimizes the risk of undue over-injection or low-injection for each cm2. Another important technical tip is to start the injection from the upper side and continuing to down the side observing 1 cm2 of space between each spot, in order to minimize the risk of overlapped injections. If the amount of PRP obtained through centrifuge is very low compared to the targeted area to treat, it may be necessary to repeat a second time the procedure of blood harvesting and centrifugation using a new kit. In this way, a larger amount of PRP will be used. Our experience of more than two years of using this kind of injection for clinical purposes strongly suggests that the mechanical and controlled injection of PRP using a gun or mechanical device is a reproducible model of PRP injection in the treatment of MPHL and FPHL. At the same time, our experience of more than four years of using this PRP preparation, suggests that the closed system for PRP preparation is a safe and reproducible model of PRP procedure. Both can be easily incorporated into training courses, as they are good teaching and training models for trainees of aesthetic regenerative surgery and aesthetic regenerative medicine. In our experience, although technically challenging in the beginning for the novice in regenerative surgery, after some training, the PRP obtained can be successfully injected to the scalp of the patient with minimal to no subsequent pain in 90% of cases. Numerous methods of activated and non-activated PRP preparations have been described in the literature10,11,12,13. Commercial systems seem to be the most commonly used for clinical, teaching, and research purposes. These procedures have been favored, due to their simplicity to use and EU safety marks. Patients treated with A-PRP were found to have greater increases in hair count and total hair density than patients treated with AA-PRP using an identical PRP collection device, indicating that PRP does not need to be activated when a specific system is employed13. In addition, the use of mechanical and controlled injection of PRP has reduced the pain and the subjective bias during the injections by reducing the possibility overlap of injections from adjacent points. The two main limitations of this model are the need for regenerative surgery skills in order to carry out the treatment and PRP preparation, and the necessity to obtain a mechanical device for injections. Another potential limitation of the model herein presented is the time of the procedure. In fact, the manual procedure is faster than the mechanical and controlled injection. The authors reported a mean of 25-45 min for each procedure of PRP injections when the mechanical device is used. The gun to inject PRP can be used in male and female pattern hair loss treatment. Its use is particularly suitable for patients more sensitive to pain, without local or systemic anesthesia. In light of these results, the authors recommend more clinical trials based on the use of mechanical systems of injections. Rousso, D. E., Kim, S. W. A review of medical and surgical treatment options for androgenetic alopecia. JAMA Facial Plast Surg. 16, 444-450 (2014). Schweiger, E. S., Boychenko, O., Bernstein, R. M. Update on the pathogenesis, genetics and medical treatment of patterned hair loss. J Drugs Dermatol. 9, 1412-1419 (2010). Price, V. H., et al. Lack of efficacy of finasteride in postmenopausal women with androgenetic alopecia. J Am Acad Dermatol. 43, 768-776 (2000). Imperato-McGinley, J., Guerrero, L., Gautier, T., Peterson, R. E. Steroid 5alpha-reductase deficiency in man: An inherited form of male pseudohermaphroditism. Science. 186, 1213-1215 (1974). Drake, L., et al. The effects of finasteride on scalp skin and serum androgen levels in men with androgenetic alopecia. J Am Acad Dermatol. 41, 550-554 (1999). Van Neste, D., et al. Finasteride increases anagen hair in men with androgenetic alopecia. Br J Dermatol. 143, 804-810 (2000). Kaufman, K. D., et al. Finasteride in the treatment of men with androgenetic alopecia. J. Am Acad Dermatol. 39, 578-589 (1998). Afifi, L., et al. Low-level laser therapy as a treatment for androgenetic alopecia. Lasers Surg Med. 49, 27-39 (2017). Uebel, C. O., et al. The role of platelet plasma growth factors in male pattern baldness surgery. Plast Reconstr Surg. 118, 1458-1466 (2006). Cervelli, V., et al. The effect of autologous activated platelet rich plasma (AA-PRP) injection on pattern hair loss: Clinical and histomorphometric evaluation. BioMed Res Int. 760709 (2014). Gkini, M. A., et al. Study of platelet-rich plasma injections in the treatment of androgenetic alopecia through an one-year period. J Cutan Aesthet Surg. 7, 213-219 (2014). Gentile, P., Garcovich, S., Bielli, A., Scioli, M. G., Orlandi, A., Cervelli, V. The effect of platelet-rich plasma in hair regrowth: A randomized placebo-controlled trial. Stem Cells Transl Med. 4, 1317-1323 (2015). Gentile, P., et al. Evaluation of Not-Activated and Activated PRP in Hair Loss Treatment: Role of Growth Factor and Cytokine Concentrations Obtained by Different Collection Systems. Int J Mol Sci. 18, (2), 14 (2017).